Undergraduates in Professor Ken Hiltner's course “The Rhetoric of the Anthropocene and Climate Change” joined him on a tour of local farm Fairview Gardens. A docent from Goleta farm Fairview Gardens greets a hen while giving a tour to undergraduate students of UCSB's Ken Hiltner, a professor of English and of environmental studies. Professor Ken Hiltner and UCSB undergrads wander the new polllinator garden at local farm Fairview Gardens. Cresting the modest hill just up from the grocery stand at Goleta’s Fairview Gardens, a visitor lands a few dusty steps from the historic farm’s shady and sprawling avocado grove in one direction, its citrus section and chicken coop in another. Or its greenhouse and bee-friendly new pollinator garden farther down. Take your pick. Whichever way you turn, it’s not a bad place to attend class. 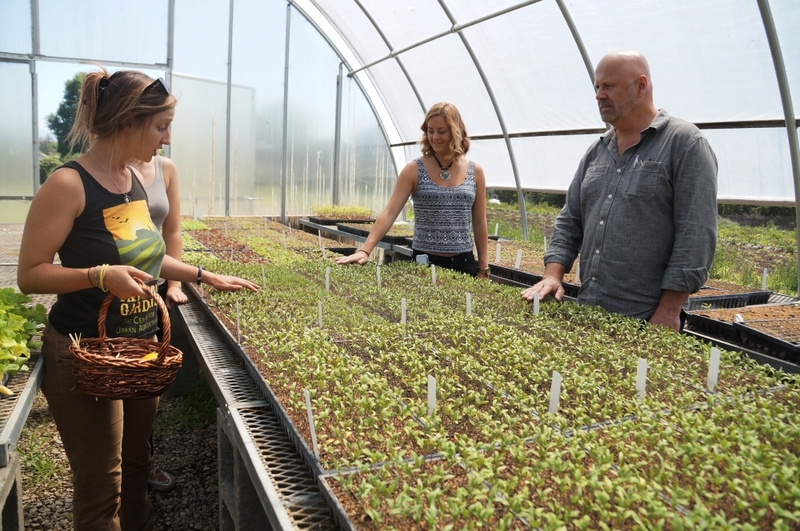 And that’s just what a small group of UC Santa Barbara students did one recent afternoon, when professor Ken Hiltner replaced his regular weekly lecture with an open-air lesson in local food and organic farming, courtesy of Fairview Gardens staff. The outing was part of his course “The Rhetoric of the Anthropocene and Climate Change,” an offering straight out of his scholarly wheelhouse: environmental humanities. The emerging field considers the role of culture in understanding environmental issues past and present, and informing how we respond to them. In this developing academic area, Hiltner, a professor of English and of environmental studies, is a respected and established expert both on campus and off. And it’s the reason he was selected as UCSB’s 2014-2015 Sustainability Champion. And he’s busy doing it, and getting others to join him. At UCSB, Hiltner has been putting his sustainability award to work — champions receive $25,000 grants to undertake environmentally focused research and projects on campus — by building the Environmental Humanities Initiative. An expansion of the English department’s existing Literature and the Environment Center, this evolving effort seeks to engage faculty from multiple disciplines in the application of humanistic study to ecological concerns. The larger goal, Hiltner said, is to edify students and the broader public about the important role of humanities in addressing those issues. And what the humanities bring to the table, according to Hiltner, is the ability to illuminate the significance of culture and history — literature, media, religion, sociology and more — in current environmental issues. Such insights can spark true change, he added, especially when coupled with the findings of hard science. A farm-raised former woodworker who returned to academics in his 40s, Hiltner said his own evolution on environmental scholarship dates back to his Rutgers University master’s thesis. What was a 30-page assignment became a 300-page book, “Milton and Ecology,” which was published in 2003 as he began his doctoral studies at Harvard. After joining UCSB in 2006, he shifted his longtime focus on the theoretical toward the tangible following a 2012-2013 visiting professor stint at Princeton. Hiltner was the lone humanist housed at the Princeton Environmental Institute with a group otherwise composed of hard scientists. The connections he made there, Hiltner said, seeded the idea that has now become UCSB’s Environmental Humanities Initiative. Hiltner received his Ph.D. from Harvard University, where he garnered a number of distinctions as a researcher and teaching fellow, including the Bowdoin Prize. He has written a number of books and articles, mostly on Renaissance literature, ecocriticism and the intersection of the two. At UCSB, he has served as director of the Literature and the Environment Center, director of the Early Modern Center and chair of the Graduate Program. The Sustainability Champion initiative at UCSB was created by the Academic Senate’s Work Group on Sustainability to focus the campus community on faculty leadership in matters related to sustainability.